E. M. Newman : Surfriding at Waikiki, 1917. 222 Fourth Avenue, New York City. Volume 5, Number 14, Serial No. 138, 1 September 1917. One Waikiki beach panorama and one surfriding photograph, page 1. 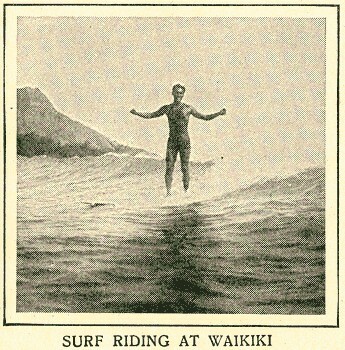 Surfriding at Waikiki text, page 5. Along the beach, which stretches for some distance, are numerous villas and hotels. A prettier spot could not be found. Hawaiian mermaids make their homes upon the soft sands of Waikiki. Marvelous swimmers are these native girls; like human fish they surmount the huge breakers that roll in over the coral reefs. The Hawaiian children, clad only in innocence, are a joy to see. They learn to swim before they are old enough to think, and they play through the surf in laughing sport like children of the waves. -Surf-board riding is the most thrilling sport at Waikiki. Picking out a "comber," as the riders call it, they fling themselves astride their surf-boards; balancing themselves and standing erect, they ride at lightning speed on the crest of the enormous roller. Like winged Mercury they seem fairly to fly over the water. One experiences many thrills and sees many spills. Although women participate as well as men, it is a sport for the sturdy, not for the timid. Equally popular at Waikiki is riding in out-rigger canoes, and these boats also require skill in handling, as they are easily overturned. There are many exciting races by crews consisting of natives who are pitted against American crews. 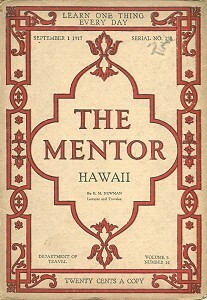 When our thoughts dwell on the Island of Oahu, Waikiki comes readily to mind in memories of sunbathed days and moonlit nights, when we sat on the beach listening to the tinkle and strum of the ukelele, the sad but melo- dious songs of the Hawaiians,. and passed the hours as if in dreamland. Serial No. 138, 1 September 1917. Geoff Cater (2007-2016) : E. M. Newman : Surfriding at Waikiki, 1917.